Installed 26 Nov 2006. Latest Update 11 Aug 2018. New or revised information is in bold. Click on images to see larger versions and other details. Installed on 07 Jul 2018. Latest Update, 21 Jul 2018. Until Ruff was released from Lake Union our skeleton crew commuted daily between Everett and Seattle. I was the ship's regular navy electronics technician. Once we got our ship properly installed at Everett we participated in underway reserve training exercises one weekend each month, remaining overnight in various Puget Sound sea ports. 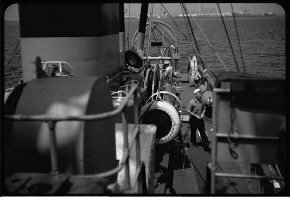 Each summer the ship sailed to Long Beach Naval Station (California) for a week of intensive mine sweeper training and evaluations. On our first return trip from Long Beach (summer 1961) we were driving over and under waves. Several in our crew were "feeding the fish" and one or two seamen were trying to find some guy named "O'Rourke." At about 0900 I got drenched by a portside gunwhale-jumping wave. Rather than digging out a fresh set of dungarees I decided to dry out in the chart house where our electronics equipments would serve as space heaters. After a while I realized that more heat was needed. There was one electronics system that we had not been using. I turned it on as well. It was our new radar associated Identification Friend or Foe (IFF) transponder system. 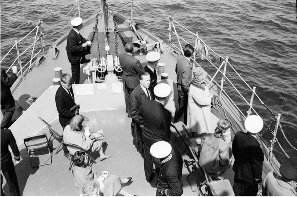 About a half hour later our ship received a message from 13th Naval District (in Seattle) which said, in essence, "Continental Air Defense Command informs us that they have a destroyer type craft near the mouth of the Columbia River squawking emergency on IFF." 13th Naval District wanted to know, "Is that you?" Best I could tell, it couldn't be us because when I trained on IFF repair three years earler (in 1958) we were told that only airplanes could squawk emergency and that you had to push a special detent-type button to activate it. We weren't an airplane and we didn't have the button. Unbeknownst to me, in 1960, IFF signaling architecture apparently underwent an upgrade. Looking way back on the issue, I now realize that Air Defense Command didn't have a problem with the idea that a ship could squawk emergency. I didn't know what four-digit code served as an emergency indicator. I think I had set our transponder response code to either 0000 or 7777. If it was 7777, then the code may have had the final two digits zeroed internally, changing it to 7700, which nowadays IS the emergency code. At this point I exercised the system's ON/OFF switch. Our skipper grilled me on whether we could be the squawker. "I don't think so." (Based on the airplane only scenario.) "You don't think so?!" . . . "No Sir, It's not us." Our reply to 13th Naval District was "Negative." Perhaps it should have been "Oops!" About an hour before sunset a Navy PBY patrol plane overflew us. We and the aircrew somehow didn't establish radio comms but the airplane had a morse code signal light in a pod slung under its port wing. The light repeatedly flashed "I F F I N T."
We took that to mean IFF Interogative? We gave them thumbs down "negatives." After two or three passes they departed our area, seemingly satisfied. Time passes. 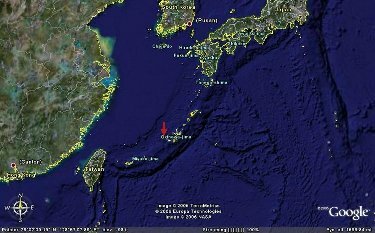 In July of 2018 I used Wikipedia, Google, and Google Earth to identify and locate radar sites that could have tagged the offending ship. My best candidate so far is Mount Hebo Air Force Station in northwestern Oregon. According to Wikipedia that site was in use from 1957 to 1979. Ruff was likely in its ocean surface coverage area when I turned on my auxilliary heater. Long Beach, CA? - 1965? I saw your list of ship's crew for the USS Ruff MSCO-54. I was her last Officer in Charge in 1969. 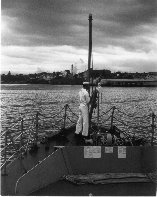 I was a boot Ensign on the USS Cape MSI-2 [Mine Sweeper Inshore] for nine months when the Navy decided to get rid of the MSIs. The Mine Squadron had to do something with me so they assigned me as Officer in Charge for decommissioning the USS Ruff. The engines had been removed before I came aboard so my function was just to sign paperwork. I didn't know anything about decommissioning a ship, and everyone else knew that too. So I told the Chief in charge that I would stay out of his way and let him do his job. If he needed me for anything he could find me sunning on the top of the pilot house. 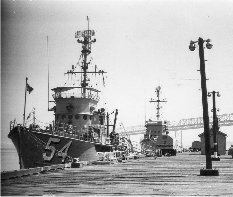 I think I was there for about a month and then they sent me to the USS Oklahoma City CLG-5 in Japan. There were about a dozen fellows working on the Ruff for decommissioning. I don't know if any of them were assigned to the Ruff or if they were part of a shipyard crew. 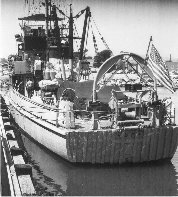 The ship was decommissioned somewhere on the north side of Terminal Island in the Los Angeles Inner Harbor.